If you like this Product you might be interested in the the Blue Tubes Specials that are running right now on DontCrack ! Designed by musicians for musicians, The Blue Tubes Analog TrackBox is not an update or a replacement for our very popular Blue Tubes Bundle, but complementary unit that incorporates a substantially different combination of elements. The Blue Tubes Analog TrackBox is an all-purpose channel strip tool designed with the ultimate in sound quality and audio character for maximum musical flexibility. The Tube-Emulator section has the unique option of being able to switch between two different sounding tube options from Single-Triode to Dual-Triode. The independent Amount and Color controls permit overdrive of the Tube-Emulator stage to vary the harmonic content of the signal. The Gate/Expander section tames the noise floor so that you hear only the audio you want to keep. This fully-adjustable gate/expander reduces (or cuts) the signal if the level becomes too low (as determined by the Gate Threshold setting). This controls unwanted background noise on the track(s). Like a compressor, the Attack and Release controls determine how fast the gate opens and closes. The Compressor section, derived from our popular Blue Tubes Compressor CP2S emulates analog compressors in terms of looks, functions, and warm analog sound found in vintage compressors to provide the classic feedback response unique to the characteristics of the Blue Tubes Analog TrackBox. The Equalizer section, derived from the Blue Tubes PEQ322 is designed to meet the most demanding studio tracks, features 2 parametric bands with center frequency, bandwidth-Q and amplitude controls as well as low-shelf and high-shelf filters. The Equalizer section delivers the controls and the amazing results of a true analog EQ. 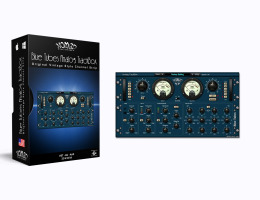 The new Blue Tubes Analog TrackBox is the latest addition to the Blue Tubes Plug-ins range, and combines all the best elements of the Tube Emulator, CP2S compressor and PEQ332 parametric equaliser to create a truly flexible and spectacular sounding valve front end for any audio system. Easy-to-use vintage interface with VU Meters.